It is quite often the case that jam and preserve are confused with each other. Although it is true that the two are indeed similar in most of their characteristics, such as the use of fruit to make them, but it must be pointed out that jam is not the same as preserve and there are some significant differences between the two. Preserves refer to a large category that includes a lot of other food items. The term incorporates all of jelly, jam, pickles, marmalade, chutneys as well as a lot of other canned foods. Rather talking in that sense, any food item that is made to last for a long time before it is consumed falls under the category of preserve! Jam is a type of preserve that is the most well-known. It has a rustic appearance and is what some may call squishy. It is a homogenous spread in which the original fruit is expected to stay intact, at least partially. This is the reason it looks similar to the original, fresh fruit and if prepared perfectly then one can sure get the exact taste of the original fruit in a jam. As for the other food items that fall under the umbrella term of preserve, they have this storage liquids/syrups that is usually very clear and is sometimes, note that only sometimes, gelled with pectin. The fruit remains intact and the final product after cooking should be plump and tender. The use of fruit together with sugar and pectin is the similarity for the preparation of jam, preserve as well as jelly and is therefore no reason to call jam a preserve or vice versa. A very simple difference would be the form in which the fruit is used in the two different dishes. When we talk about jam, the fruit used is usually in the form of fruit pulp or is sometimes crushed fruit which is what makes it less stiff compared to jelly. On the other hand, the fruit used in preserve is normally in the form of fruit chunks in a syrup. In some cases, although very rarely, whole fruit may also be used in preserve. Therefore it can be easy to differentiate the two from their appearance; a chunky texture would certainly mean that it is preserve and not jam. Another difference would be the use of pectin. 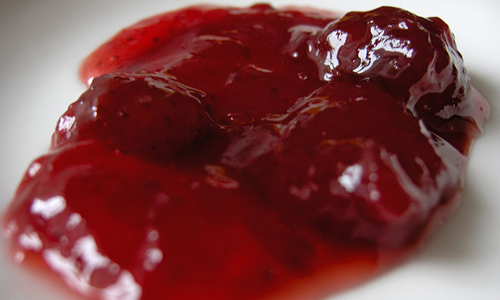 Almost all jams contain pectin which is considered an essential ingredient for jam. This is not so for preserve; the addition of pectin is optional and some people prefer preserves without it. The usage of pectin in jam is for thickening it which is not necessary for preserve as it already consists of chunks or whole fruit so thickening is not required. Moreover, the quantity of pectin in jam can be varied until the fruit becomes very soft. This probably accounts for the fact that whereas preserves are the least smooth and have the least amount of ‘gel’ in it, jams are smoother and less gelled, having a similar texture to pureed fruits. However, it is common to find seeds of the fruits in jams, especially fruits such as berries. allana. "Differences between jam and preserves." DifferenceBetween.net. October 9, 2014 < http://www.differencebetween.net/object/comparisons-of-food-items/differences-between-jam-and-preserves/ >.